Whether you record in Presenter or an external program like Audacity, you already know recording is the easy part. 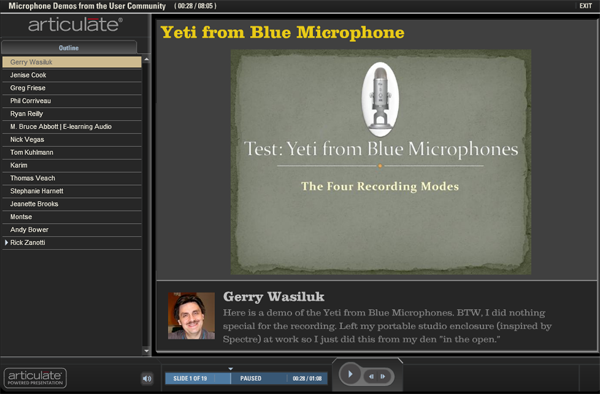 For most elearning designers, the real challenge is in choosing the best microphone. And it makes sense considering there really isn't a way to demo microphones. Maybe someday there will be Microphone Stores where you can walk in and try out a dozen or more mics before buying. But until that day, we'll have to trust our ears and our community. Knowing microphones are such a hot topic, we asked you to tell us which microphones you used and to include a sample recording. The response was great and below you can hear the shared examples. Want to share your own? If you'd like to share your own examples, use the comment below to include your microphone model and a link to a recording sample. We'll update the microphone demos to include your contribution. You can also download the PowerPoint template from the PowerPoint Templates gallery. Thanks! This is very handy! Thx for sharing Jeffrey! I updated the demo to include your example. I would think that a mediocre voice, even if human, is better than a robot. Remember, the idea is to connect with your audience and a robot can't do that. @Jeffrey . Good point ! I'm a little late to this conversation! You don't necessarily have to put yourself into the ideal recording environment. Really only your microphone needs to be in it. I've made a version of this sound box (http://www.harlanhogan.com/portaboothArticle.shtml) and it really works quite well. As for having a sucky voice ... take a couple of voiceover classes. Often it's not the timber or sound of your voice so much as your delivery. Google voiceover to find lots of resources. Nolene - do you have any audio samples from the box you created? Do you have any tips for making your own recording box? Thanks! I do have samples, but I guess I'll have to make a Slideshare or Flickr to share them? Plus I wanted to "upgrade" my box to actual acoustic foam. I'll post the comparisons sometime next week. We use the Yeti as our microphone. In a building with limited sound barriers, it does a wonderful job of picking up the voice and not picking up the background noise. Has anyone used a hand-held recorder placed on a base of some sort to record voiceovers? I am trying to dual-purpose a mic that can be used on-the-field to grab sound bites for my modules and then as a desktop set-up with a DIY sound booth. @Carlo - I know someone who had the Zoom HRN and it was amazing. I'm trying to get him to post a sample here. What's great about the Zoom is you can run your pro mics through the XLR connectors if you need to. But the sound quality from the handheld alone was impressive. He returned it not for quality reasons but because the screen was tough to read--text was too small, crowded and not the best UI. I've been using Blue microphones, such as Snow Ball, and from my experience Yeti is a great option with a great quality/price relationship. And as important as the hardware is the software used to record and to edit (normalize, erase noise, etc.). I'm using WavePad, from http://www.nch.com.au/wavepad/ and I'm quite happy with the output. Audio quality is one of the most significant factors in how your project is received. In today's workplace, most people are using headphones (often, high quality) to listen to media on their computers. Noisy or otherwise poorly recorded audio is an assault on the senses. You don't have to have a broadcasters voice. Be comfortable and conversational. Many people get nervous when recording which makes their voice tense, striated, and higher pitched. RELAX. Do your recording right after yoga :-) Do not use noise canceling or cheap headset microphones. If you will be doing this for any length of time, investing $100 - $200 is an investment and shows great respect for your learners ear drums. I most use a RODE NT1-A or an AKG C1000S. Most professionals I talk with agree that for voice, especially if there is nothing else in the mix, is best recorded with a large diaphragm condenser mic. In a day or so I'll post some audio samples and make a quick tutorial on the "secret tricks" that can help you make a big improvement in quality and consistency. @Bruce - thanks for sharing! Those are some great tips and I totally agree about not worrying about one's voice and how sounds or doesn't sound. Looking forward to hearing and posting your samples. I purchased a Zoom H2 and upon first impression, it seems to work great. I will try to make a portable sound booth to see how it will improve sound quality. @Carlo Awesome! I heard some samples from the HRN model and they sounded great. I'm really interested in these handheld recorders that double as audio interfaces. Please share samples when you can! Here is a demo of 4 types of microphones. It's a password protected video, the password is: articulate (I thought that up all by myself) http://vimeo.com/22995443 I think you'll agree, the contrast between these (especially compared back to back) is significant. It will also depend on what kind of speakers YOU are using. There isn't a lot of difference when listening on my laptop built in speaker. Using headphones or plugging in the 3 piece BOSE speakers there's a huge difference which comes back to my initial point. Many people are using high quality speakers and headsets. We should produce audio with that realization in mind. The "secret tips" I promised will be coming up in my next post. Thanks Bruce! Those sounded great and you're right about listening through speakers vs headphones. Can you say a little more around why you think most people are using higher quality speakers and/or headsets? Having come from the larger corporate world, it was my experience that most everyone had rock bottom quality audio equipment. The only folks with better quality headphones were those who brought their own into work. It's a great point either way which goes to why understanding our audience and how they're listening to our courses is so important. Good catch David. For clarification, and based solely on my own observations as I've walked around offices, MOST people are using headsets (as opposed to speakers) to listen to content, and MANY are using the headphones they brought from home. There are also cases where modules may be previewed or shown to a group in a meeting room with good audio equipment. That's not the time to discover the audio quality is poor. Headsets vs speakers: What's the biggest consideration when recording for either? Bruce: I updated the demos to include your contribution! Thanks again. Also updated links back to everyone's profile page. I have tried the $40 headset and the $150 headset and, while the sound quality was much improved, I had major issues even at $150. Time to move up to an actual micophone! Can someone recommend a mic that will give me decent sound quality for a "my department doesn't have it's own budget" price? Also, what type of connection (to the computer) is best? Bad luck with USB so far. Thanks very much. @John: There are many great mics out there. As you can see/hear from the samples, we can argue for weeks on which is best :) But one "bang for the buck" mic that I use (as Bruce mentioned early) that can yield terrific sound is the Rode NT1-A ($200). But I hate to recommend any mic before determining what kind of environment you are recording in--as that is the greatest influence to me on the type of mic to purchase. For example, because the NT1-A I mentioned is a large diaphragm condenser mic, it will pick up everything (which can be a good thing and bad thing)...so you will want an acoustically-solid recording environment free of noise and reverb. In my case, I found a storage closet in my office with loads of boxes and blankets that do a nice job of dampening the sound...so the NT1-A has been perfect for my VOs. But I once was forced to use the same mic in a reverb-heavy office with some background noise outside the room...I still cringe at the end result. So it depends... BTW, the Porta-booth mentioned many times in this forum can do a nice job of improving the existing acoustics around the mic--and is worth considering--but is by no means the perfect cure for a lousy recording space. To connect to your PC, you'll need an XLR-to-USB adapter such as the Shure X2U (http://amzn.to/lE6qvD). This device has a built-in preamp, and provides phantom power to the mic and a clean signal to the PC. It hasn't failed me yet. Alternatively, there is a nice selection of dedicated USB mics on the market (and growing all the time)--where you plug directly into the PC. Although I don't use them, many here have reported terrific results. Blue, Samson, and MXL seem to be the most notable brands.